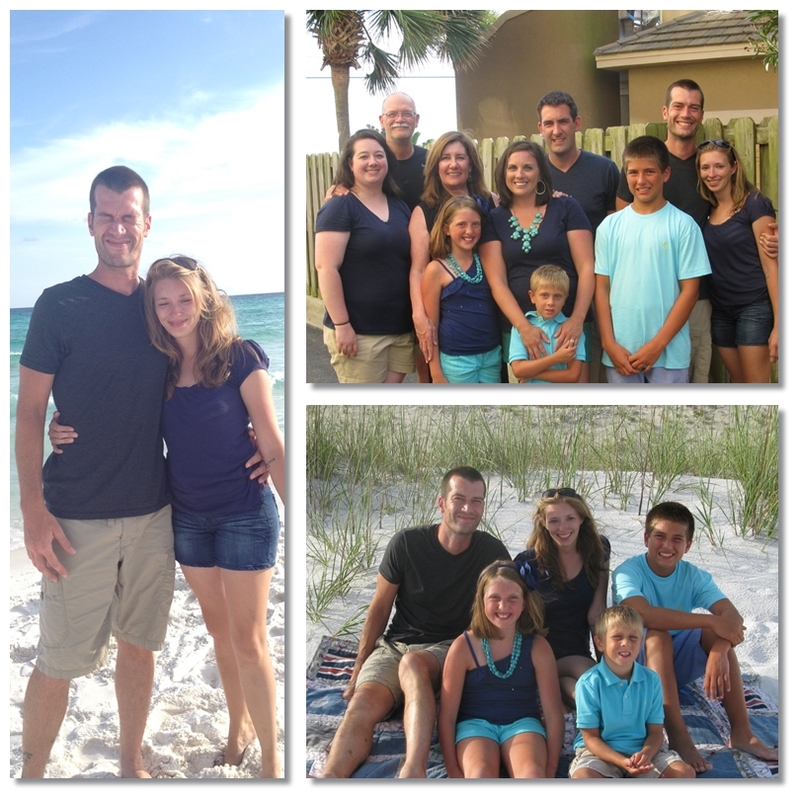 The Friday before last we made the last minute decision to take a week off from the boat and join AJ's family on their summer vacation in Destin, Florida. I had never been to a Gulf Coast beach, and it was pretty different from the Atlantic beaches near us. The water is a gorgeous clear blue-green lapping on soft squeaky sand, so white that your eyes water. Many of us got reflection sunburns just sitting in the shade! The shallows go on forever and the waves were gentle - unlike the recent Atlantic waves that can take an arm off. It's a fantastic beach. Our niece and nephews had a blast playing in the surf and catching the burrowing sand fleas/mole crabs and small fish with their net and bucket. We had a wonderful relaxing time catching up! 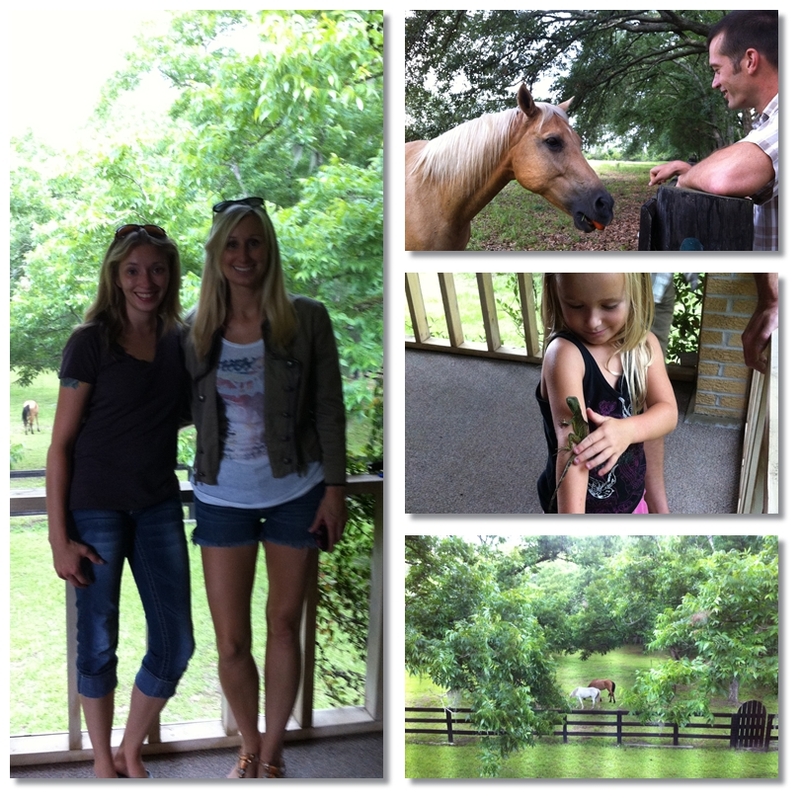 After leaving Destin we stopped in Monticello to see my cousin. My family was spread out all across the country growing up, so I didn't spend a lot of time with aunts and uncles and grandparents and cousins. The last time I saw Ashley was.... Well let's just say I remember a debate over the existence of Santa Clause. I got word that she had recently moved to Monticello and we would be driving right by on our way back! When we exited the I-10 I did not expect to fall off the map into a dreamscape. Huge canopy trees dripping with Spanish moss keep the whole tiny town shaded from the sun. A lovely white stone antebellum courthouse stands proud in the center of a roundabout on the main road. There were no stoplights. It was beautiful. But we still weren't prepared for what lay behind an impenetrable hedge of crepe myrtles. A gorgeous yard with a stand of those magnificent trees, shading a lovely retreat surrounded by a stable and horse pastures. She keeps horses. I learned that unwanted horses are pretty common, and she's adopted a few, two mustangs, one mare of pure Spanish descent and a stallion that seems to have a draft horse in its lineage, plus a honey colored american quarter house and a small-but-full-grown white three year old "pony". I had not seen a horse since 5th grade camp, and was pretty excited about it. Though AJ has always spoken of horses as smart, powerful mammals ... that can dispose of you anytime they want to, thus not a creature you should trust or endeavor to encounter. And while it may be impossible not to feel insecure in the company of such large beasts, I think they won him over. He fed them carrots with the encouragement (demanding?) of Ashley's daughters. One of which is quite taken with dragons, and proudly showed off her very own Chinese water dragon. Lucky girls! I had a wonderful time with my aunt and cousin, and I wish I'd gotten to spend more time with them! I think we'll have to plan a trip back before we become totally boat bound, or maybe sail there soon after. We made another stop on the way back to say hi to an old acquaintance from our Russellville, Arkansas home town college days who had also turned to sailboat life on the Florida coast... And we forgot to take a picture! Hey Nicole! You're rocking it! On the drive south back to Stuart we were reminded by a billboard that the Space Shuttle Atlantis exhibit had just opened at the Kennedy Space center. Pepsi cans have come with a buy-one-get-one-free admission promotional coupon for months now. So I started choosing Pepsi. 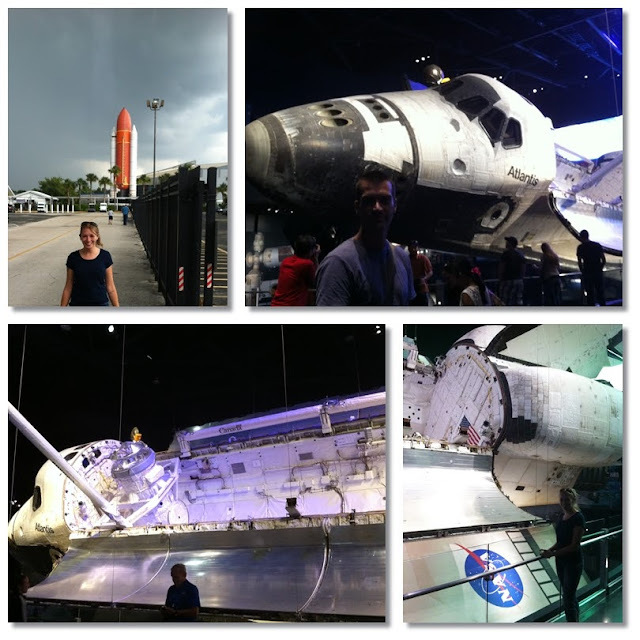 AJ and I are total space geeks by the way, so we couldn't resist the detour. AJ took me to the space center back in February for my 31st birthday, but they didn't have a retired space shuttle when we were there, though they had installed the exciting launch simulator. But Atlantis, perfectly preserved from its last flight complete with all the battle scars from atmospheric reentry, that's something we had to see. Space Shuttle Atlantis was named after RV (Research Vessel) Atlantis, a 145' ketch rigged sailing vessel built in Massachusetts in 1930 for the Woods Oceanographic Research Institute. It's still in service today in Argentina under the name El Austral. The vessel has put over 1.25 million miles under the keel in its 83 years!! 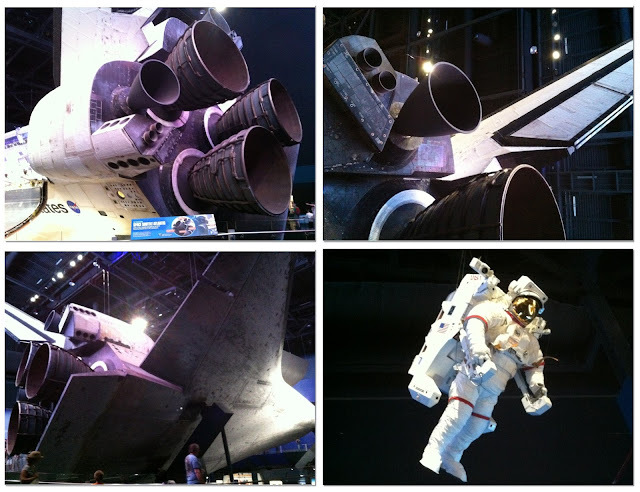 Space Shuttle Atlantis has flown nearly 126 million miles and orbited earth 4,848 times in it's 33 missions to space since 1985. Its last launch in July 2011 was the final mission of the space shuttle program, two years after Endeavor was decommissioned and being prepped for display in Los Angeles, and Discovery was being decontaminated after it's last flight to sit at the National Air and Space Museum, D.C. Now commercial space flight services the International Space Station. But don't let the end of the space shuttle program get you down! Ladies and gentlemen there's a new spacecraft in town. 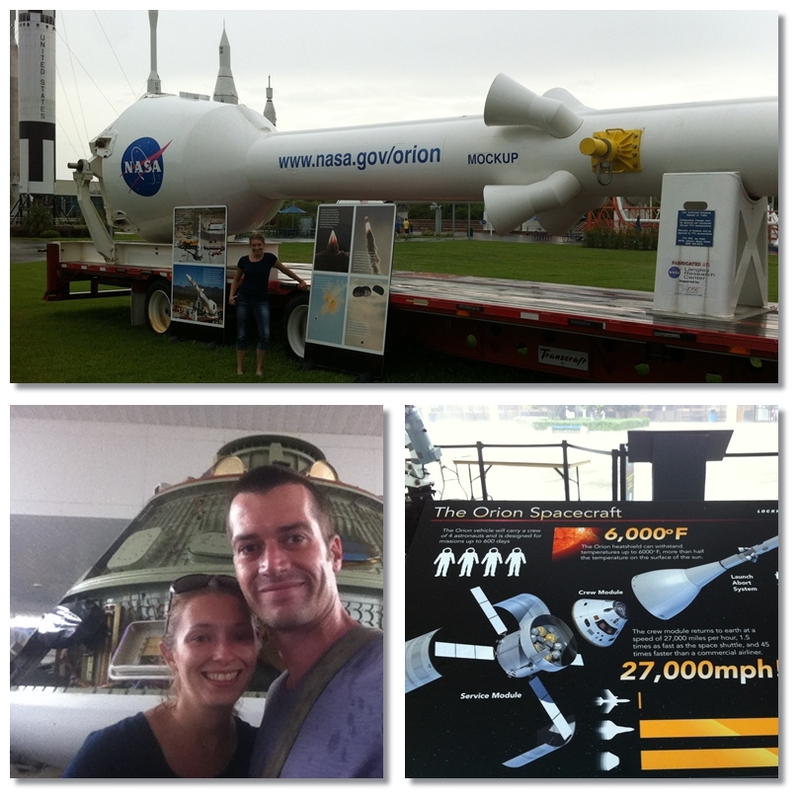 The Orion Capsule. The Orion Capsule is not for servicing the ISS. It's for manned missions "beyond low-earth orbit." a.k.a THE MOON!, ASTEROIDS! !, and MARS!!!. It will be servicing missions in conjunction with the SLS (Space Launch System) heavy lift rocket. The largest rocket ever built! The SLS rocket will also be providing heavy cargo lift capabilities to the ISS and ... "future orbital operations" ... My guess is that the first moon station will be built in orbit and then propelled towards a selected landing/entrenchment site on the moon. That way the heavy-needs-fuel-and-fuel-is-heavy rocket propulsion problem to get into orbit is eliminated altogether, and we can "just release" the in-orbit-assembled moon station directly from the 20,000 mph orbital sling of earth's gravity slingshot. And unlike the shuttle, Orion has a fool proof launch-abort evacuation plan! !!!! !Watch This Video Of The Launch-Abort System Test And Be Amazed!!!!! Below is a full size replica of launch-abort system, followed by us in front of a real Orion crew capsule with the shielding removed. A sudden downpour forced us into the gift shop. 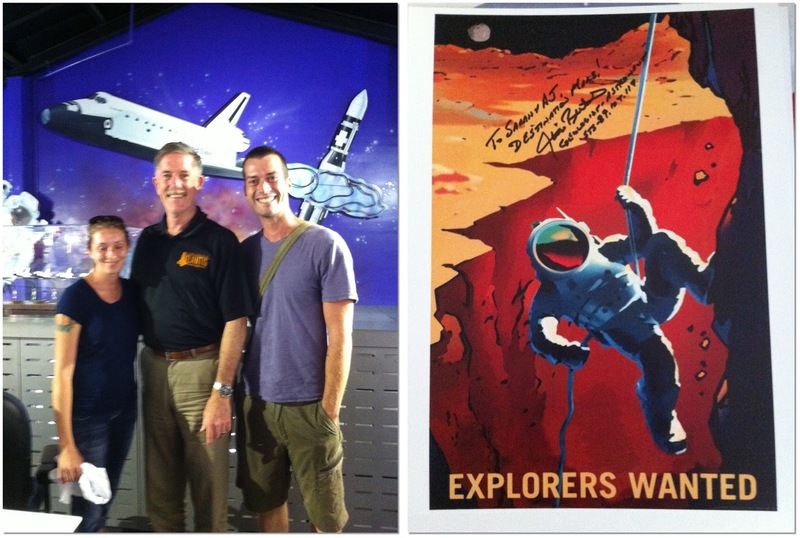 Luckily, because Astronaut James Reilly's was there to meet and greet and sign autographs! Reilly went to space aboard Atlantis twice. He flew on STS-89 aboard Endeavor in 1998 and docked with the now defunct Russian station Mir [Peace]. Then with Atlantis on STS-104 in 2001 to deliver and install the joint airlock module on the ISS, and aboard Atlantis again on STS-117 in 2007 for ISS maintenance and to install the second half of the solar array. Aside from having a Ph.D. in Geoscience, designing multiple parts of the shuttle, and installing parts on the ISS, he has logged over 853 hours in space, including five spacewalks totaling over 31 hours. He has traveled 14.7 million miles in exploration for humanity. To me there is no greater "celebrity" than a scientist, an astronaut, an explorer. The names of these men and women may not have yet seeped into our pop culture vocabulary, but eventually, they will be among the only relevant names of history. Their work has taken mankind's original questions ~ "Who am I?" "Where did I come from?" "Why am I here?" ~ out of philosophy and into the tangible realm of science. They strap themselves to the tips of rockets and jettison themselves into inhospitable space to find out. They created Hubble to take pictures of our universe's past. It just doesn't get any more impressive than that. The opportunity to get an autograph gave me an excuse to buy the "Explorers Wanted" art print that I'd been eyeing in the gift shop. It makes me smile. James Reilly laughed when he saw it, and said "I really like this one, but they wouldn't let us do that." Someday Dr. Astronaut Reilly... someday... I Want To Believe. I'm going to hang the autographed print somewhere in the boat. Maybe some of the luck from his few hundred orbits will rub off on us in our humble attempt at a 'round the world exploration in our own little capsule, the SV Robin. I was a little too starstruck to stay in focus.
" The most beautiful thing we can experience is the mysterious. It is the source of all true art and all science. He to whom this emotion is a stranger, who can no longer pause to wonder and stand rapt in awe, is as good as dead: his eyes are closed." ~ Albert Einstein.